This is different type of physical puzzle. When you tap on the white panels, you open or close the portals, through which the cat can travel in space. To complete the level it’s necessary to feed the cat at least once and fly to the exit. The game is full of folding panels, buttons, milk bottles (which make the wooden panels suitable for the portals), loads, and spinning panels with ice. 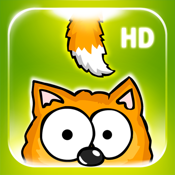 If you complete 40 levels, you can get back the lost tail.